Little is known about the genes involved in the initial cyst formation and disease progression in autosomal dominant polycystic kidney disease (ADPKD); however, such knowledge is necessary to explore therapeutic avenues for this common inherited kidney disease. To uncover the genetic determinants and molecular mechanisms of ADPKD, we analyzed 4-point time-series DNA microarrays from Pkd1L 3/L 3mice to generate high resolution gene expression profiles at different stages of disease progression. 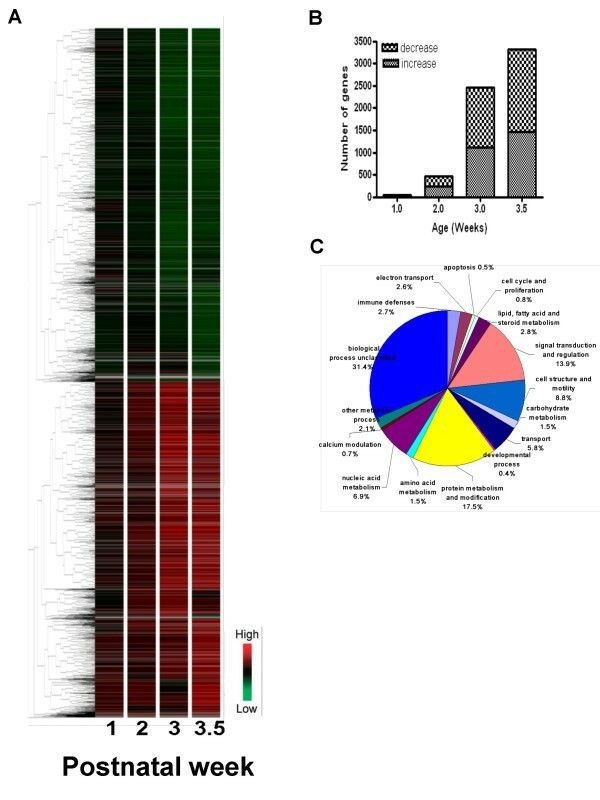 We found different characteristic gene expression signatures in the kidneys of Pkd1L 3/L 3mice compared to age-matched controls during the initial phase of the disease. By postnatal week 1, the Pkd1L 3/L 3kidney already had a distinctive gene expression pattern different from the corresponding normal controls. The genes differentially expressed, either induced or repressed, in ADPKD are important in immune defense, cell structure and motility, cellular proliferation, apoptosis and metabolic processes, and include members of three pathways (Wnt, Notch, and BMP) involved in morphogenetic signaling. Further analysis of the gene expression profiles from the early stage of cystogenesis to end stage disease identified a possible gene network involved in the pathogenesis of ADPKD. ADPKD is one of the most common lethal genetic diseases in the world, with a prevalence of about one in every 400 to 1000 persons and a 50% chance that an ADPKD patient will die of kidney failure [1–3]. Early changes in the disease process are very important, and unraveling more of the initial steps in pathogenesis may afford patients better management possibilities and an improved prognosis. Determining the molecular mechanism of the pathogenesis of ADPKD, including the early period of cyst formation, requires investigation of changes from before the earliest period of disease manifestation in a defined animal model that mimics the human disease [4–6]. One well-used approach to unravel the molecular pathogenesis and pharmacology of metabolic and genetic diseases is the cDNA microarray [7–9]. We have previously developed an animal model of ADPKD by generating Pkd1L 3/L 3mutant mice . Homozygous Pkd1 null mice appear normal when born, but rapidly develop polycystic kidneys and generally do not live longer than 3.5 to 4 weeks. Here we refined the genetic background of our Pkd1L 3/L 3mutant mice so that the disease more closely resembles most human ADPKD individuals in the late onset of symptoms and final progression to end-stage renal disease (ESRD). This refined animal model will facilitate the study of ADPKD progression and the evaluation of possible treatments. In this paper we present the gene expression profile of Pkd1L 3/L 3mice and their normal littermates at different time points, as determined by cDNA microarray. The materials and methods used in this study were described detail in the additional file 1. During the course of refinement of the genetic background of the ADPKD model mice to a congenic C57BL/6 genetic background, an earlier onset of polycystic kidney phenotype (see Additional file 2) was seen than with the previous mice on the SV129/C57BL6 background. Histological examination revealed that the translucent enlarged kidneys were due to the formation of numerous large cysts in homozygous mutant mice. Smaller cysts formed early in PNW 1, and became larger at PNW 2. The cysts were disseminated and distributed cross the cortex and medulla. At PNW 3.5, the cyst occupied the entire kidney and normal kidney architecture was hardly seen (see Additional file 2C). All Pkd1L 3/L 3mice were born normally, but most of them did not survive past four weeks (see Additional file 3A) in the congenic C57BL/6 background. In gross appearance, there was no difference between Pkd1L 3/L 3mice and their age-matched control littermates at PNW 1, but Pkd1L 3/L 3mice were shorter of stature with a slightly wider abdomen by PNW 2, and more obviously so by PNW 3 (see Additional file 2A). On necropsy, these homozygous mutant mice had much enlarged and translucent kidneys compared to their heterozygous or wild-type littermates (see Additional file 2B). The gross kidney alterations were first seen at PNW 2 and became more severe at later time points. Although the body weight was only moderately reduced in homozygous mutants (see Additional file 3B), there was a large increase in kidney weight/body weight ratio (kw/bw) (see Additional file 3C) and kidney volume (see Additional file 3D) in homozygous mutant mice. Similar changes in kidney volume were seen in Pkd1L 3/L 3mice compared to the control littermates. Renal function was also severely impaired in homozygous mutant mice as evidenced in the progressive rise in BUN (see Additional file 3E). To study the detailed gene expression profile of ADPKD, we generated and compared gene expression profiles of Pkd1L 3/L 3mice and their aged-matched wild-type littermates at different stages, i.e. PNW 1, 2, 3 and 3.5. There were significant differences in expression profile seen at all timepoints examined (Figure 1A). 4,231 genes were found to be differentially expressed in the Pkd1L 3/L 3kidney at one or more timepoint (Figure 1B and see Additional file 4), and these genes were assigned to one of 16 functional categories (Figure 1C) based on a previous classification. The number of genes in each functional class that differed at each time point of the disease was then determined (see Additional file 5) and the top 10 genes in each group according to their gene expression ratio at PNW 3.5 were listed (see Additional file 6). Relative gene expression levels in Pkd1L 3/L 3kidney compared to control. (A) Hierarchical clustering of Pkd1L 3/L 3/wild-type expression ratios for 4,231 genes differentially expressed in kidney at one or more ages between PNW 1 and PNW 3.5 (replicate samples normalized to wild-type at each age). Genes more highly expressed in Pkd1L 3/L 3mice are indicated in red; those expressed in Pkd1L 3/L 3mice at levels lower than wild-type mice are indicated in green. Red and green represent up- and downregulation, respectively (see scale in lower right corner). Ten gene clusters were identified as labeled at right. Vertical black bars on the sides (1,917 downregulated genes in A1–A5, and 1,806 upregulated genes in A6–A10) indicate regions with characteristic gene expression change patterns. (B) Numbers of differentially regulated genes by age in Pkd1L 3/L 3mice. (C) Functional class proportions of all genes differentially expressed in Pkd1L 3/L 3and wild-type mice from all time points (PNW 1, 2, 3 and 3.5). In addition, several genes differentially expressed in this model are components of three morphogenetic signaling pathways. Quantitative real time PCR was performed to validate gene expression changes identified by microarray analysis during disease progression (see Additional file 7 for details of primers and conditions). Genes involved in the Wnt, Notch and BMP signaling pathway were examined, and most gene expression patterns were consistent with the microarray results (Figure 2A). Validation of genes involved in the Wnt, Notch and BMP signaling pathways and early differentially expressed genes at PNW 1. (A) Twenty differentially expressed genes from the microarray were validated by RT-PCR using Gapdh as a reference gene. The time point that showed the greatest relative change in the microarray was selected for RT-PCR. 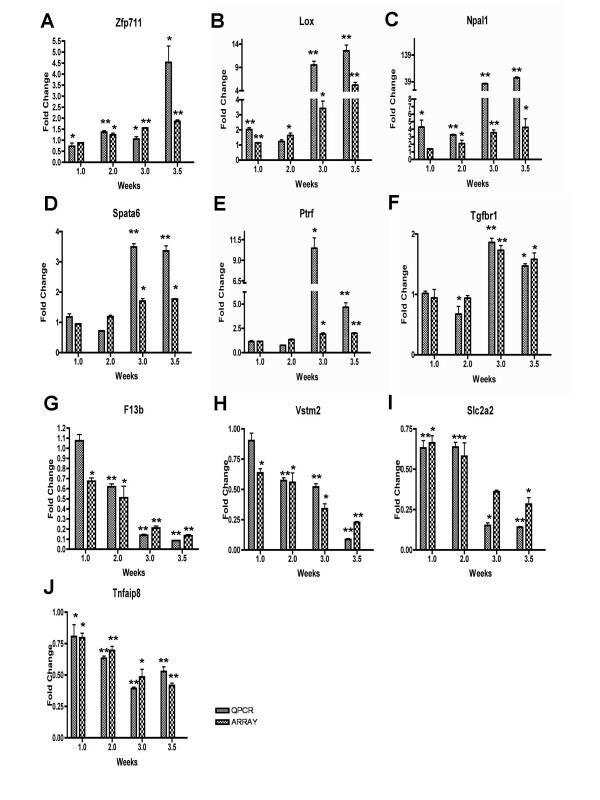 (B) RNA was extracted from Pkd1L 3/L 3mice and age-matched control littermates at PNW 1. The RT-PCR and microarray results are compared in the same figure (mean ± SD of triplicate PCR reactions of pooled RNA; n = 3; *, P < 0.05; **, P < 0.01 compared with wild-type mice, by Student's t-test). An original goal of this study was to identify gene expression alterations in Pkd1L 3/L 3kidney during the initial and progressive phases, which may represent specific landmarks in a molecular signature of ADPKD. A total of 50 genes met these criteria by PNW 1 (see Additional file 8): 16 upregulated genes and 34 downregulated genes. The genes affected were virtually all implicated in adaptive and/or pathogenic mechanisms that might be linked to cystogenesis or disease progression (see Additional file 8). To further confirm the differential gene expression at PNW1 observed with the PKD custom microarray and suggested by IPA as being important, we validated the differential expression of the Klk gene family using quantitative real-time PCR analysis normalized against the housekeeping gene Gapdh. The genes selected were Klk3, Klk1b5, Klk1b8, Klk1b26, Klk1 and Klk1b9. The expression pattern of all selected genes was consistent with the microarray results (Figure 2B). In general, PCR-based estimates of expression change were larger than those observed in the microarray study. These genes may prove useful as potential therapeutic target candidates. To gain insight into the potential functional consequences of differentially expressed genes in Pkd1L 3/L 3mice, the differentially expressed genes were analyzed by the program IPA (Table 1). IPA identified 4 significant networks among the early genes altered in the Pkd1L 3/L 3mice at PNW 1, associated with cardiovascular system development and function, gene expression, and cell morphology (Table 1). We also analyzed PNW 2, 3 and 3.5 data with IPA (see Additional file 9), and we found other network might be involved in the pathogenesis of ADPKD during disease progression, such as tissue morphology, development, and cellular movement. a Genes whose expression was either increased or decreased in Pkd1L 3/L 3mice as a function of age were identified by correlation analysis across four time points: 1,2, 3 and 3.5 weeks. In order to find genes related to disease progression, the Pearsons' correlation coefficient of affected genes of Pkd1L 3/L 3mice at PNW 1, 2, 3 and 3.5 was calculated. A small number of genes whose expression was constant in control mice but whose expression either continuously increased or decreased in Pkd1L 3/L 3mice was identified, and the 5 annotated genes most well correlated to disease progression (with P values lower than 0.05) are shown in Table 2 and Figure 3A–E. RT-PCR was performed to validate these five genes. The expression of these genes increased progressively, consistent with the microarray results (Figure 3F–J). Selected genes which might be related to disease progression from correlation analysis and RT-PCR validation. Genes whose expression increased or decreased with disease progression were identified by correlation analysis of microarray data (A~E). Changes in transcript abundance are expressed as amount of change relative to control mean for that gene, and individual values of three different mice and the mean are shown at each week. 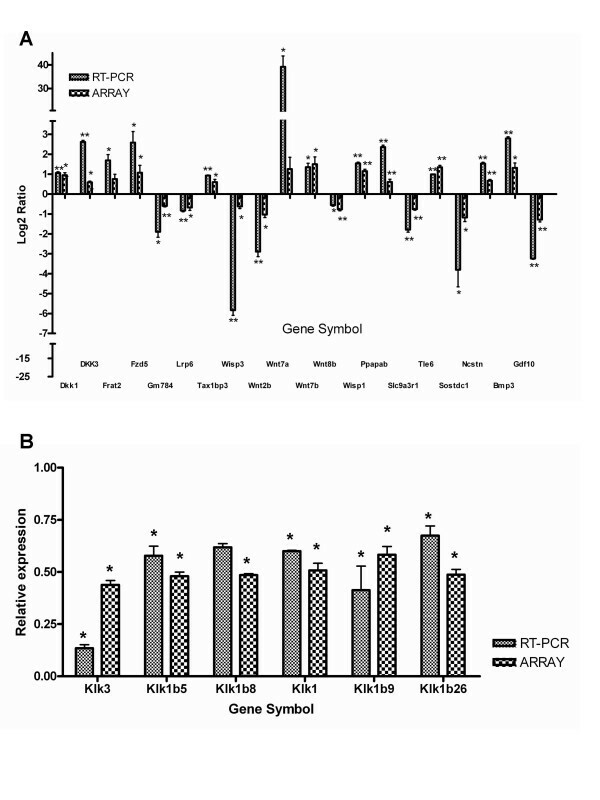 (F~J) Validation of the microarray results by QRT-PCR analysis, showing relative change of PCR signal between wild-type and Pkd1L 3/L 3mice (mean ± SD of triplicate PCR reactions of pooled RNA; n = 3; *, P < 0.05; **, P < 0.01 compared with wild-type mice, by Student's t-test). We also performed immunostaining to investigate TGF-beta receptor expression in kidney at corresponding time points. In PNW 3.5 wild-type mice, there was only faint staining for TGFβ Receptor 1, mainly in renal tubules. In Pkd1L 3/L 3kidney, TGFβ Receptor 1 was strongly expressed in cyst epithelium and interstitium (Figure 4A). The over-expression pattern was also seen with TGFβ Receptor 2. 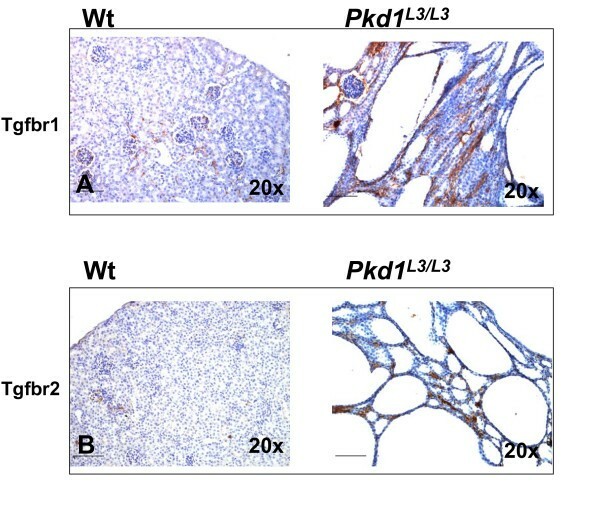 Significantly increased TGFβ Receptor 2 immunostaining was observed in Pkd1L 3/L 3kidney in cyst epithelium, interstitium and distorted glomeruli, in contrast to the weak staining in wild-type littermates (Figure 4B). 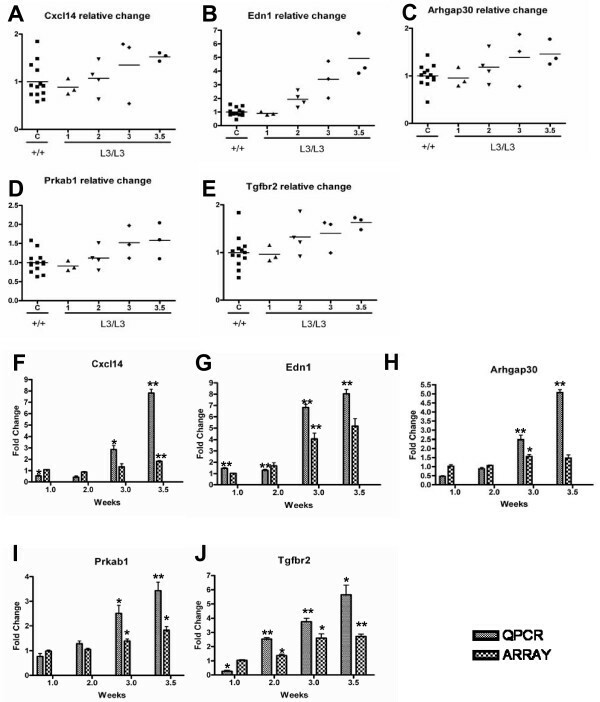 Elevated expression of TGFβR1 and TGFβR2 in Pkd1L 3/L 3and control mice at PNW 3.5. Immunohistochemistry of kidney of Pkd1L 3/L 3and control mice at PNW 3.5, using monoclonal antibody to TGF-β receptor subtypes 1 and 2, visualized with diaminobenzidine (DAB). Representative images for Tgfbr1 (A) and Tgfbr2 (B) are shown. Scale bar shows 100 μm. To further confirm the differential gene expression at each time point observed with the PKD custom microarray, we validated their differential expression patterns using real time PCR analysis. We randomly selected six up-regulated genes, Zfp711, Lox, Npal1, Spata6, Ptrf and Tgfβr (Figure 5A–F), and four down-regulated genes, F13b, Vstm2, Slc2a2 and Tnfaip8 (Figure 5G–J), and verified their expression level by quantitative real time PCR, normalized against the housekeeping gene Gapdh. The expression pattern of all selected genes was similar to and consistent with the microarray results (Figure 5A–J). In general, PCR-based estimates of expression change were larger than those observed in the microarray study. These genes may prove useful as potential therapeutic target candidates. RT-PCR analyses of selected genes ( Zfp711, Lox, Npal1, Spata6, Ptrf, Tgfbr1, F13b, Vstm2, Slc2a2 and Tnfaip8 ) of Pkd1L 3/L 3and control mice at different stages. RNA was extracted from Pkd1L 3/L 3mice and age-matched control littermates at PNW 1, 2, 3 and 3.5. Three micrograms of total RNA from each group were reverse transcribed and cDNA equivalent to 10 ng total RNA was used for the PCR reactions. The graphs represent the relative change compared to control groups after normalization against Gapdh expression (mean ± SD of triplicate PCR reactions of pooled RNA; n = 3; *, P < 0.05; **, P < 0.01 compared with wild-type mice, by Student's t-test). Comprehensive gene expression profiles from early to end stage ADPKD were generated from Pkd1L 3/L 3mice, an improved disease model. Several distinct early expression signatures of differentially expressed genes with potential roles in cystogenesis were identified. These genes are involved in several pathways including cell proliferation, apoptosis, transport, and immune defenses. A variety of biochemical pathways are clearly involved in the pathogenesis of ADPKD, both in initial cystogenesis and throughout disease progression, with extensive crosstalk between different pathways. Further investigation of these genes and their associated networks may provide insight into the possible pathogenic mechanisms of ADPKD development, and identify potential diagnostic and prognostic markers and novel therapeutic targets. We thank Shu-Yun Tung at the Microarray Core Facility of Institute of Molecular Biology, Academia Sinica for her excellent technical support. We thank Wei-Neng Hung, Kuo-Jen Yen and Hsing-Chun Lin for data processing. This work was supported in part by research grants from the Chen-Han Foundation for Education, Academia Sinica (94M003) and the National Science Council (NSC95-2314-B-303-003). WCC and HL were involved in designing the study. WCC and YST were involved in the animal breeding, tissue collection, RNA purification, microarray analysis, interpretation, and qPCR validation. WCC was involved in the statistical analysis and involved in data interpretation and writing of the manuscript.